Pitting two of the world’s greatest superheroes in a showdown can only be truly appreciated in the world’s most immersive cinematic experience. Bookings for one of 2016’s most anticipated films, Batman v Superman: Dawn of Justice, are now open. For super-fans of DC Comics’ superheroes, the very best way to watch this blockbuster is in Ster-Kinekor’s IMAX® theatres. 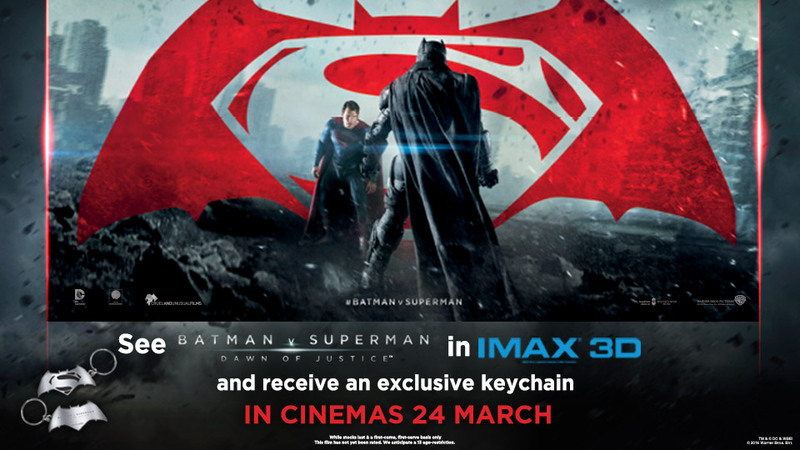 Watching the movie in IMAX has a further benefit – you may be lucky and receive a limited edition Batman v Superman keychain, but only while stocks last. The film, which releases countrywide on Thursday, 24 March, can also be seen in the luxury of the Cine Prestige 3D cinemas at select sites, and at all Ster-Kinekor cinemas. The IMAX 3D release of Batman v Superman: Dawn of Justice has been digitally re-mastered into the image and sound quality of an IMAX Experience® with proprietary IMAX DMR® (Digital Re-mastering) technology. The crystal-clear images coupled with IMAX's customised theatre geometry and powerful digital audio, create a unique environment that will make audiences feel as if they are a superhero and a part of all the action playing out on the big screen. Director Zack Snyder elected to shoot select scenes of the film using IMAX’s high-resolution cameras. As a result, those watching the film exclusively in IMAX theatres will view these sequences as they expand vertically to fill the entire IMAX screen, delivering greater scope and breath-taking image quality for a truly immersive experience. In all the Ster-Kinekor IMAX theatres, these IMAX-shot scenes will expand up to a 1.9:1 aspect ratio (the proportional relationship between an image’s width and its height), resulting in audiences enjoying 26% more of the image than on a standard cinema screen. Directed by Zack Snyder, Bruce Wayne/Batman (Ben Affleck) and Clark Kent/Superman (Henry Cavill) share the screen with Amy Adams and Diane Lane, who return as Lois Lane and Martha Kent respectively, and Gal Gadot as Diana Prince/Wonder Woman. This Warner Bros./DC Entertainment co-production is penned by David S. Goyer and Chris Terrio. Ster-Kinekor’s IMAX® theatres are at the following cinema complexes: Gateway in Durban, Baywest Mall in Port Elizabeth, Cape Gate in Cape Town, The Grove Mall in Pretoria, Cradlestone Mall in Krugersdorp and now at Eastgate in Johannesburg. For more information on Batman v Superman: Dawn of Justice in Ster-Kinekor, IMAX® 3D and Cine Prestige 3D cinemas, download the Ster-Kinekor App on your smart phone for updates and to book tickets from your mobile. Visit www.sterkinekor.com or sterkinekor.mobi. Follow @sterkinekor on Twitter or Ster-Kinekor Theatres on Facebook. For queries, call Ticketline on 0861 MOVIES (668 437) or book at the box office.